Translation has always been Peter Jackson's gift. He took the phone book-dense Lord of the Rings saga and made it not just understandable but elegant and weighty. He turned the raging id of two teenage girls into a wholly tactile and believable fantasy kingdom in “Heavenly Creatures.” He invented a canon of a silent film director to explore and archive in the all-but-forgotten “Forgotten Silver.” This urge to turn something vast into something easily digested could partially be explained by his relationship to the first World War. 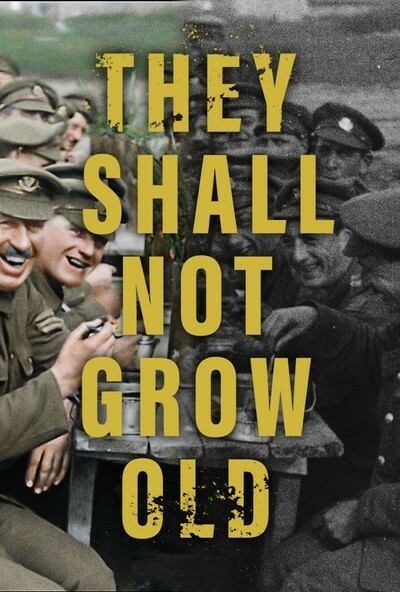 His latest, the astonishing and peculiar documentary “They Shall Not Grow Old” ends with a dedication to the family he and his wife/co-writer/co-producer/co-everything Fran Walsh lost in the war. Suddenly it becomes clear that his movies, from the piles of guts in his zombie movie “Dead Alive” to the walking ghosts of “The Frighteners,” have all along been stuck on battlefields his audience has never seen. “They Shall Not Grow Old” begins with black and white footage of soldiers preparing to leave for battle, a haunting 4:3 square of arrested motion, small in the center of the frame, as men march to what was likely most of their deaths. "I gave every part of my youth to do a job," says the first phantom voice. The film is filled with voices, credited at the end, that speak over faces whose identity we'll never learn. The anonymity is part of the point. The governments responsible for orchestrating the conflict viewed them as chess pieces. "It was like a great big game," says another voice a moment later. Indeed, that was how Kaiser Wilhelm, his cousin Tsar Nicholas II, French president Raymond Poincaré, British prime minister David Lloyd George and President Woodrow Wilson saw it, throwing hordes of young men into the meat grinders on the German front lines and making millions, in Wilson's case, playing the war powers against each other and staying out of the conflict until it made financial sense. It can be easy to lose track of mammoth scope of World War I, which is why it makes sense that a New Zealander would want to make a film about the men who fought it. New Zealand's population was just over a million people and about ten percent of that number (nurses and fighting men of myriad ethnic extractions) went to fight in the war. Roughly 17,000 men from that colossal fighting force were killed and another 41,000 wounded. The deaths tend to be harder to ignore in a smaller place and it's quite obvious that the scars of the conflict made their way down to Jackson and Walsh. The impetus for the project was both the anniversary of the armistice that ended the war and advancements made in digital manipulation of antique footage. Jackson and Walsh have done something special bringing all this old footage to new life, complete with newly looped voice recordings to fill in the action, booming sound effects to match cannon fire, and adding color. Once again, he's translated something that's growing ancient into a series of images and ideas a modern audience will be able to grasp. And if we can make sense of the image, we can hopefully make sense of the horror it portends. The narrative begins on a slightly absurdist note as some of the British are playing a German team in a football match when the news of the war reaches them. They decide to finish their end-of-match festivities, and then go home and prepare to kill each other. The voices are British, which means it is their outlook with which we are presented. Jackson had already given us one version of the war when he made "The Lord of the Rings" movies and especially when he filmed the battle of Helm's Deep, in which his version of the slaughter on the western front and/or the Gallipoli campaign is depicted. “They Shall Not Grow Old” is not about the mindlessness of combat and murder, but of the identities lost and forged by gunfire, of the many thousands of selves offered up to the god of war. When the combat begins, the footage turns from black and white to color, and a peculiar thing happens. The digitally touched images of combat look wrong, like the whole thing has been created from a misfiring memory, which does eventually help the film. Initially it calls to mind landmarks of digital cinema like Eric Rohmer's “The Lady and the Duke” and Lech Majewski's “The Mill And The Cross,” where the past is dreamt up through computer-generated recreations of antique paintings; an early version of the conjuring act Jackson performed in his "Hobbit" movies, which recreate the texture of silent movies like Fritz Lang's “Das Rheingold” and Abel Gance's “Napoleon” on his enormous canvas. If the updated footage is strange, there's a reason. The sky is the key to the whole thing, really. World War I is depicted in the popular imagination as a maelstrom of mud and smoke, of a perpetually gray nightmare. And it was, men drowned in mud and lived in puddles of their own waste. When Jackson's footage expands and turns to color, it's so bright. The greenery in the background of most of the images practically sing, the uniforms are variantly colored and the sky is luminescent, sometimes even blue. It's a simple thing but if it's not the first film to show World War I taking place under heavenly blue skies it certainly feels like it is. The odd clarity is a horrible but absolutely necessary gift from Jackson and Walsh to these men. Their faces are so alive when they smile, the sky practically smiles at them from above, and still they marched to their death. They shaved with tea, they drank water from gasoline cans, and they died in broad daylight. The unnatural, digitally augmented movement of long dead faces has a peculiar, uncanny quality but the film is meant to unseat us. The disembodied voices of the living veterans, recorded many years ago and stored in an archive, describe moments between combat as a darkly comic parade of bodily fluids, moldy food, corpse-eating rats and lice. When the explosions and gunfire start, it's hell on earth. Decaying corpses, bullet-riddled men covered in flies and horses lying in the dirt, red with blood, unblinking eyes fixed forever on the lens of the camera that caught its image are just some of the terrors made new by Jackson, Walsh and their enormous post-production team. The men look bizarrely alive but then so does the unending torment they suffered. A shot of men running into a cloud of yellow gas looks more awful for its crudeness and sits more heavily on your mind than any description could. "We were just doing a job, if it came it came," says a man describing the moments before German bombardments shattered their line. These men are countless voices and faces lost to time, made anonymous by a higher power, an eternal reminder of the way battle dehumanizes all who come near it. We may continue to find new ways to pay tribute to the men and women we lose to war, but we can never bring them back.